The hills of a Caribbean Island frame this colorful sunset. In the distance, a small boat adds a nice touch. 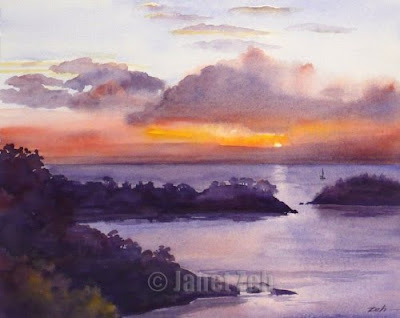 Sunsets in watercolor are delightful to paint. You can see the areas where the colors run together making lovely cloud formations. I am especially pleased with the fresh, spontaneous look of this seascape. This painting uses a limited primary palette which seems especially nice for sunsets. A print of St. Lucia Sunset is available in my Print Shop. Thanks for stopping by today.